We are a rescue family – one dog, two cats, and a rabbit, all rescues. I also have a full time job, a child, and of course, a blog. Although I do volunteer with several local rescue organizations, I wish I had more time to serve and money to donate. Unfortunately, I am always short on both! But thanks to PetSmart® and their new Buy a Bag, Give a Meal™it just got easier to help more animals in need! In celebration of its 30th anniversary, PetSmart just announced the launch of its new Buy a Bag, Give a Meal™ program. For every bag of dog or cat food purchased online and in all its stores across the U.S., Canada, and Puerto Rico, PetSmart will donate a meal to a pet in need served by shelters, animal rescue organizations, and food banks. 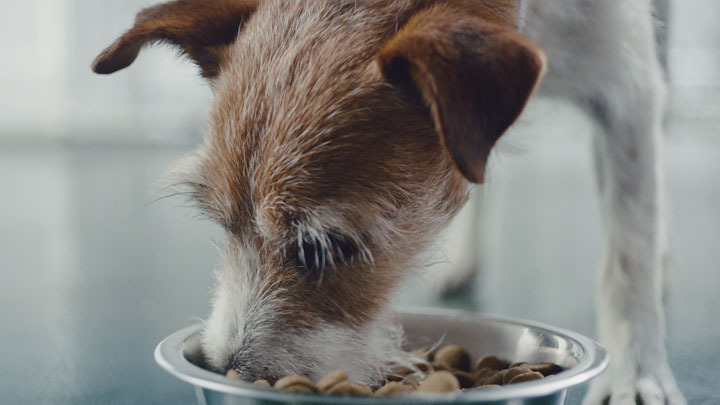 PetSmart expects to contribute more than 60 million meals under this program, the biggest philanthropic campaign in its 30-year history. The Buy a Bag, Give a Meal™ program runs from now through the end of the year. So, keep shopping at PetSmart and help feed hungry and homeless pets just by sticking with your normal routine. According to David Haworth, DVM, Ph.D., president of PetSmart Charities, up to 7 million pets enter shelters every year across North America. A recent survey by PetSmart Charities found that only 20% of the nearly 1,800 animal welfare partners receive pet food donations even though its one of their largest costs each year. 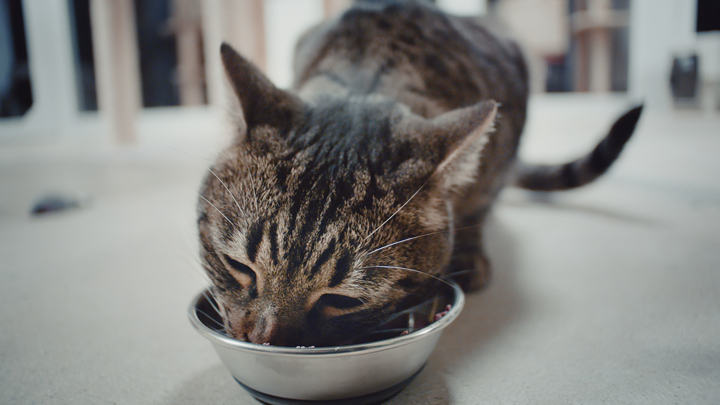 Furthermore, it is estimated that one in seven Americans rely on food banks and pantries where pet food is also rare. As a result many families in need have to make the heartbreaking choice of whether they will feed themselves or their beloved pets. But now, we can all help these animals by purchasing our dog and cat food at PetSmart – something many of us do anyway. Not only will the Buy a Bag, Give a Meal™help animals in shelters, but it will also benefit those who rely on food banks. Having volunteered at a food pantry, I know this is huge need and will be much appreciated and save many lives. You can read the full press release here. PetSmart, with its nonprofit partner, PetSmart Charities, has been a leader in adoption, saving more than 7.3 million pets’ lives – more adoptions than any other brick-and-mortar organization. PetSmart Charities is the leading funder of animal welfare across North America, donating more funding support – about $300 million to date – to help pets in need. 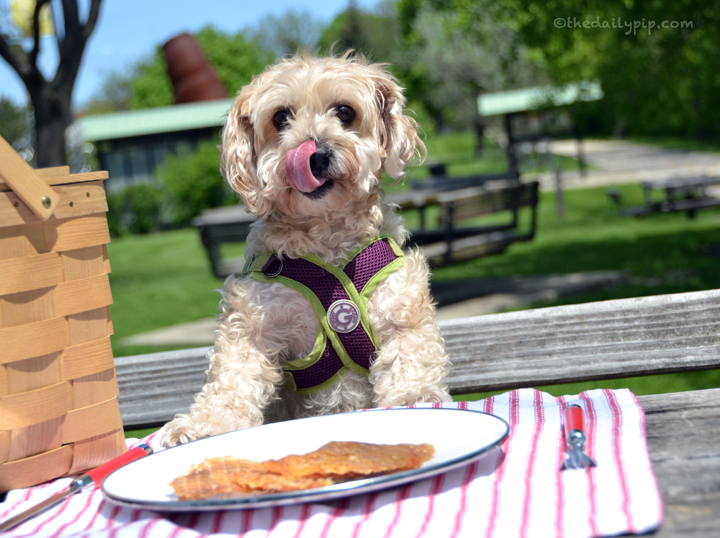 Ruby is so excited about PetSmart’s Buy a Bag, Give a Meal™that she thinks we should celebrate by letting her eat at the table with us – just this once! 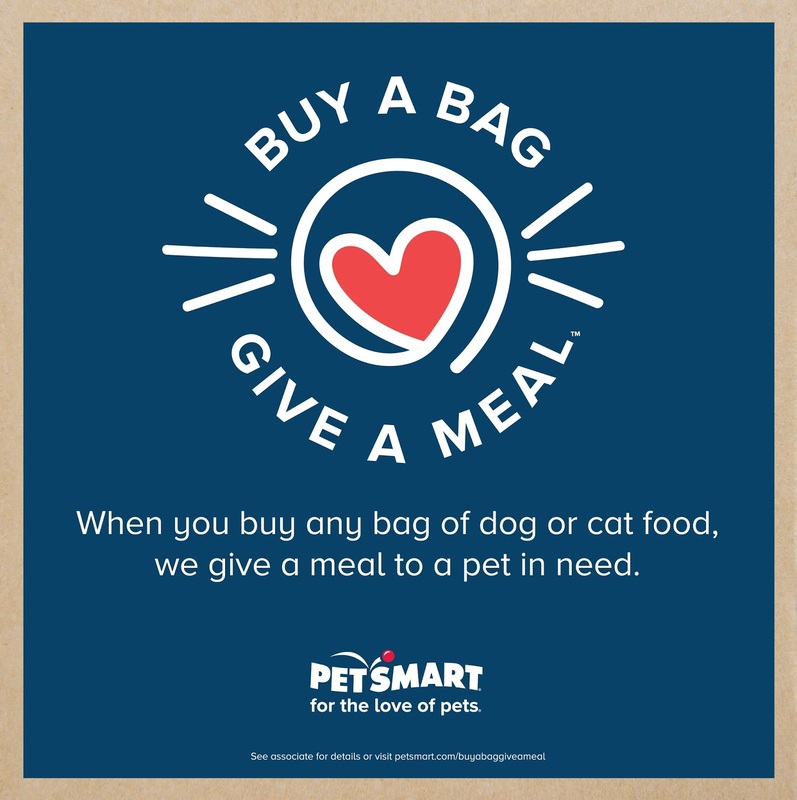 For more information on Buy a Bag, Give a Meal™, please follow PetSmart on Facebook, Twitter, and Instagram. Previous Post Bunny Basics: Where Should My Rabbit Live? I just love PetSmart and all they do for our fur friends! Such a great program! PetSmart is very giving! Oh, I love that PetSmart is doing this. I always wish that there was more I could do for animals in need, and this is one way that anyone can do just that. Kudos to PetSmart! And thank you for sharing this with us! Oh Ruby, we did hear about this! It sounds like a wonderful program. So glad PetSmart is doing this! What a great program! I'd never heard of this before. Thanks for spreading the word. That is so wonderful and we hope many tummies are happy! Great idea. Bill feeds strays as he trucks. There are always a variety of strays around truck stops, as well as many factories, etc. Hugs. Good job PetSmart! What brand is Ruby's harness? I love it!! Hi – Ruby's harness is The PerfectFit by Gooby. Here's our review of it from last year http://www.thedailypip.com/2015/11/rubys-perfect-fit.htmlThanks for stopping by! What a pawsome thing to do! That is such a good idea. We sure will do that.Great way to get some meals to the homeless critters. This program will help change the future for so many animals – thanks for sharing and we'll re-share with our readers as well! This is just an amazing and easy way for pet parents to help out others! This PetSmart program is such a wonderful way to help those in need! Love Petsmart for their charity work. Even adopted one of our dogs through a Petsmart Charity. This is such a nice campaign for homeless dogs. Thanks for sharing the buy a bag give a bag. Kudos to PetSmart for doing this! We love seeing major brands support rescues! This is such a pawesome program. Thanks for spreading the news. I love that PetSmart is running this program. It will help a lot of animals! I love this program. Wish more companies would so things like this. The animal welfare group I volunteer with runs a pet food bank. Our local Petco and PetSmart donate food to them on a monthly basis. I don't if our group knows about this promo, but I have now emailed them about it. Kudos to pet stores that go the extra mile! Any bag of any food? Check. I love this. How inspired is that a company gives back and does it Big Time! !Yaay Petsmart! Kilo the Pug suggests maybe I need to give him more food and buy more bags at PetSmart to help more dogs and humans in need. It is such a great program. Love that it is so easy to give back and doesn't cost extra. What a wonderful program. I purchased a bag of cat food from PetSmart last week, so I hope that purchase qualified. What a great program! Petsmart sure does good stuff for so many pets. Great program! We love all of your pics…especially the one of Ruby!! Headed on over to PetSmart soon! Petsmart does some really thoughtful things for companion animals and their guardians. Wish more pet suppliers would do the same.